Great to hear. Should consider the skipping carefully of course and whether or not the things taught in it could benefit you. An android app for the Brussels metro sounds awesome and really exciting! This comment was edited by Setementor on Feb 04 2013 11:24pm. That's great! How was Croatia? I'm doing really good but pretty busy. Wanted to ask, how's it going? OMG! I guess people can understand why I thought they were scary when I was 5-6 or so. By the time I was 9-12, I thought they were very cool though. This comment was edited by Dash Starlight on Aug 30 2012 03:52pm. 5, 4, 3, 2, 1... THUNDERBIRDS ARE GO!!! Awesome! I'll get in touch soon, just playing the last few days of SWG before it is shut down a week on Friday morning. What time were you online today Deg when you idled (roughly) and how many people came on? This comment was edited by Cuthalion on Feb 19 2011 08:38pm. 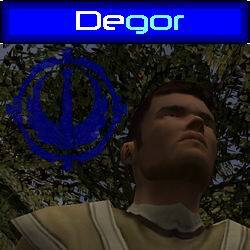 Heya Degor, guess who's still watching from the shadows of the academy? How are you doing ? A website you might find interesting to find ideas. It's saying that you do have ideas (you have had some good ideas sometimes to be fair). It's proposing that you could draw your challenge (to create an epic program/project) in the middle of some paper and let the ideas flow. It's right that a lot of great ideas come from a combination of the ideas and events around you and it's also right that talking with friends and asking questions can really help you brainstorm. They also emphasize how many ideas you can find on the internet if you need somewhere to start. As I said before too, you might consider looking for a problem or dilemma that you or others experience in life; something that really affects you but you wish it didn't; something that you wish there was a better solution for; something that you wish existed; something that could be produced and put right with the right variables, if statements, loops and database calls! I can't stress enough how much really delving into the problems that occur in you and your friends' lives and brainstorming with them or even combining several problems and ideas can help produce good ideas. When Thomas Edison got sick of rubbing two sticks together whenever he wanted to turn on the light, he invented the Light Bulb. When Tim Berners-Lee got sick of waiting 3 days for his letters and demonstrations to get places, he invented the internet. When numbers got too much for William Seward Burrough's head, he created the Calculator. When Philo Farnsworth wanted to see what was going on in the world, he brought the world to his living room by building the first television. When computer users got sick of using the command line, they made text-based file managers, CD managers, music players. When they got sick of console programs, they developed GUI. When they wanted more flexibility and simplicity with their music player to drag around and organise files, they developed Windows Media Player. When they wanted to store disks on their computer, they made Daemon Tools to simulate disk drives. When people got sick of flicking a switch to turn on the light, they used voice-recognition software to prompt the computer to turn on the light for them so they could turn it on with their voice. When computer gamers got sick of not having enough players, they invented NPCs. When companies got sick of being confined to their computer room, they developed the Gameboy, the Laptop and the iPhone. When you have a problem with a crazy but realistic solution, make it happen! It's building and improving on what already exists, giving things that already exist in your life something that people always wanted or always could have used but never had that produce the big ideas. You could try building or improving an old game ie. pacman, tetris, quake 1 2 and 3, even jk2 or jka. Degor! I was just thinking it's been a while the other day too. We should talk and have some duels again sometime. I'm pretty good actually and it's very hot and sunny here too! Not that I expect it to last, the weather here likes to be hot, cold, hot, cold, hot, cold, etc. The trees and plants don't seem to know whether to grow or die. As far as your project goes, all of those languages are very good and exciting to play with. Perhaps you should focus less on the language and more on what you want the project to be. Then when you have a good idea worked out you can decide which programming language would best achieve what you want to do. The best way to get ideas is to really think about what people say, really think about problems you and others present during the course of a day. Then conceive some kind of epic improvement or solution however crazy or amazing it is. As usual I'm no good with random ideas but if I think of anything I'll let you know. Just make it something epic! w00t, Deg! How are you man? I am doing pretty ok, Degor. Things have been a little bumpy here and there in RL but nothing I couldn't handle in the end. So yeah, there are always slight ups and downs, but that's life I guess. I'm great. Good luck with your exams! Hey Degor, how are you?